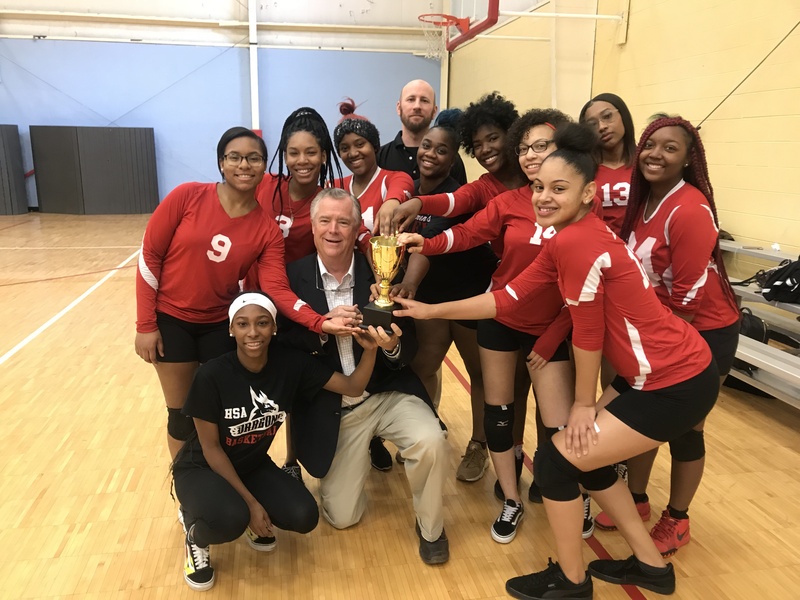 On March 13, 2019, the first annual volleyball game fundraiser at HSA Cleveland High School was played. The girls volleyball team faced off against a boys basketball team in an epic volleyball match. After the girls won the first set and then the boys won the second, the boys narrowly won the third set 23-25. Both teams received trophies from Mr. Chris Hitchcock, Executive Director of the Fred A. Lennon Charitable Trust. Thanks to Principal Mehmet Gurbuz, Athletic Director Aaron Sayre for their support to make the game happen, thanks to the teams for their gracious professionalism and sportsmanship, and a special thanks to all the guests who came to support the cause. We look forward to a bigger match in October 2019 and hope girls will take their revenge! This fundraising event supported the high school’s sports teams.